If anxiety paralyzes you or interferes with personal relationships, then it’s important to get help. There are many options out there, but what’s the best treatment for anxiety? 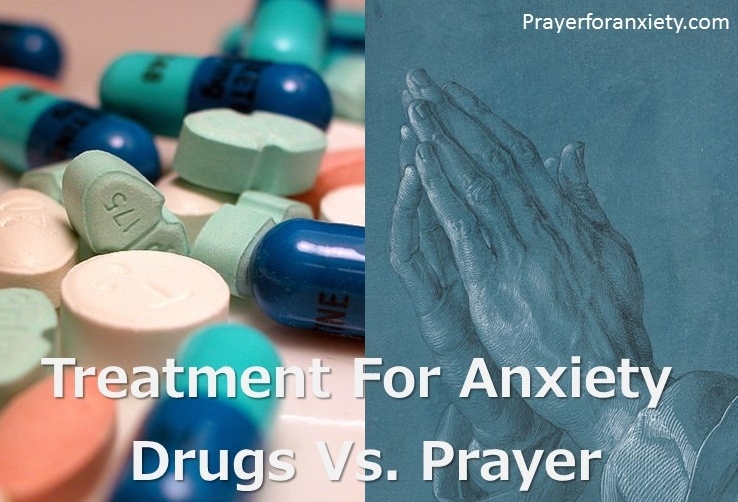 Let’s compare drugs vs. prayer. It’s important to keep in mind that anxiety is typically multi-factorial, and treatment should be tailored to each individual. For many years the medical community relied on psychotherapy as a mainstay of treatment. Later, medications were added, and currently there are at least 25 different prescription drugs that can be used in the treatment of anxiety. Meanwhile, prayer has been used for thousands of years to treat anything that ails the human psyche. Do Drugs Work For Anxiety? According to pharmaceutical studies and patient testimonies, medications can be helpful in the reduction of anxiety symptoms. However, there can be a high cost to treatment. For example, the benzodiazepines (Ativan, Xanax, Valium, etc.) have a well-known potential for addiction. SSRIs (Prozac, Zoloft, Paxil, Celexa, Lexapro, Luvox, and Viibryd) might also be semi-addictive. Withdrawal symptoms are sometime mistaken for a relapse in illness inadvertently committing the patient to many years taking prescription drugs. Any medication used to treat anxiety is not used to “cure” the illness. The goal is symptom reduction with the hope of remission. Drugs can certainly work to relieve symptoms, but in some cases they may cover up the real issues causing anxiety. Psychotherapy looks to fill the gap in unmasking/treating the root causes. Spiritual obstacles to healing should be taken into account as well. Does Prayer Have Real Health Benefits? Does Prayer Have Side Effects? Unfortunately, evil can manifest itself in perverse ways, the worst of which is using God’s name to do harm or manipulate others. Religion can be abusive; however, it’s not the prayer itself that is harmful. In any case, care in selecting a spiritual guide is essential. Jesus often said, “Your faith has healed you.” Medical science backs this up with the placebo effect. When some people take a pill, even a sugar-pill, they get better. Even more surprising is that even when they know that the pill is not a real drug, some people still react positively. It might be faith in the medical system or in ingesting a pill, but the healing – as Jesus correctly identified – comes from within. Just the physician/patient encounter alone can improve symptoms. If placebos work, then the answer is yes. However, prayer is the ultimate placebo since it places faith in the truth of Christ resurrected. When we build our hope on this impossibility made real by God’s Spirit, we can overcome great obstacles. The God/person encounter can produce miracles. The research behind the benefits of prayer is intriguing, but our capability to understand this is limited. Even though we all know that love is beneficial; we could never “prove” that love exists. Like God, love just is, and there is nothing more certain in this universe than God’s love. Medical science is useful, but like all treatments it should be accepted prudently. The first thing you can do to get better is pray. Still, if your symptoms are overwhelming, you might need help from a mental health specialist – and even better if it’s a Christian professional. Anxiety is fed by uncertainty. If you know where you came from (created by God), who you are (child of God), and where you are going (heaven), then worry begins to decrease. Build your hope on the foundation that is Jesus Christ. Pray every day for God to free you and heal you through His Son. Pill image source & prayer image source.